The subject we are going to present addresses the deepest spiritual-scientific foundations of conscious human activity in Nature. The process, thanks to which man can initiate a conscious cooperation with the evolution of the kingdoms of nature, started long ago and peaked in the sacrifice made by Jesus Christ on Earth, in the Earth and for the Earth - 2000 years ago. This sacrifice was certainly the greatest of the sacrifices made by the entity of Jesus Christ for evolution. It achieved the redemption of Adam and the subsequent victory over death. As we will see, in the last century and a half this new era had a further development with the result that a renovated humanity could have the strength to begin collaborating on the general evolutionary project. 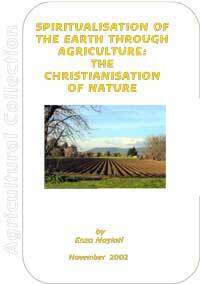 To go into this process we must first make a quick overview of the development of agriculture. Agriculture, from its birth until the present, has undergone many changes as a result of the changing consciousness of man. Agriculture began about 7000 years ago with the impulse brought by the great Persian initiate Zarathustra, called Zoroaster by the Greeks. Even his name, Zoro-aster, means 'shining star' or 'solar star', and this tells us that first type of agriculture practiced by mankind, "talked" with the stellar sphere. In fact Zarathustran agriculture was connected to the Zodiac, thus drawing on the laws and entities that govern the whole solar system. In more recent times we find that Greco-Roman Agriculture already began to lose the connection with the influences arising from the sphere of the Zodiac, and therefore, so to speak, moved down one rung in the diagram below.